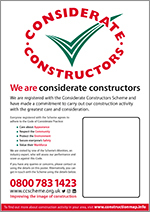 Thank you for registering your company with the Considerate Constructors Scheme and for making a commitment to help improve the image of construction. We know you are busy individuals but we would ask that you take a few moments to read this page thoroughly to ensure that you are fully prepared for your visits and are aware of all of the information and support available to you. You will shortly receive your Scheme branded materials and we would ask that these are promptly displayed in line with Scheme requirements. Please check the company details printed on your posters and contact the Scheme’s administration office immediately if any of the details are incorrect. 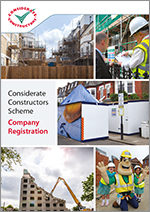 A useful brochure detailing how registration actually works, what the monitoring process looks like, how your company will be scored and also providing an introduction to other aspects of the Scheme’s offering. This is an extremely useful guide to get you started if you are new to the Scheme. Various Scheme-branded products are available to registered Companies to help you promote your registration and the commitment you have made. All companies receive a number of standard products as part of their registration and a variety of additional products can be purchased online by following the links below. 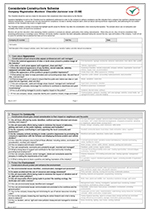 A copy of the Checklist that the Scheme Monitor will use to assess your company’s performance against the Scheme’s Code of Considerate Practice. Please take time to understand what the Monitor will be looking for to ensure you are best able to answer their questions at the time of the visit. 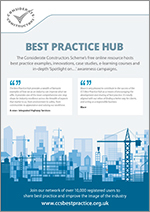 This valuable online resource hosts various features to help you and your team, including a library of best practice tips, numerous case studies, e-learning modules and a vast array of useful resources. 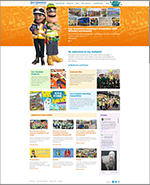 Industry mascots, Ivor and Honor can be used to help you engage with a young audience and promote a positive and aspiring image of the construction industry. Also find out more about the annual competitions available to everyone registered with the Scheme by clicking below. 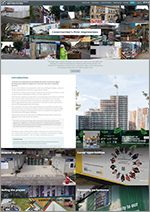 Learn more about the Scheme’s campaign aimed at improving the first impression created by construction sites across the UK. 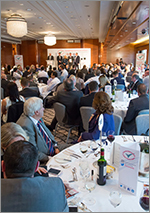 The Scheme delivers various events throughout the year including the prestigious National Awards, the Image of Construction event and numerous workshops, all designed to showcase considerate construction to the industry and the wider public. 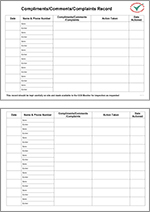 The Scheme’s compliments and complaints template is designed to help you track your project’s feedback. A Scheme Monitor will contact you at an appropriate time to arrange to visit your company. The purpose of this visit is to assess your company’s performance against the Code, to provide feedback on potential areas for improvement and to highlight performance beyond compliance. Our Monitor will consider the public, the environment and your operatives when visiting your site, focusing on those issues listed on the appropriate Company Registration Monitors’ Checklist.